1. To make the barbecue sauce, place the chicken stock in a pan over medium-high heat and reduce until it weighs 150g approximately. Place another pan over medium heat, add the sugar and cook until a medium caramel is formed. Slowly add the rice wine vinegar while whisking until the caramel has dissolved. Add the remaining sauce ingredients and whisk until well combined. Set aside. 2. To make the blue cheese sauce, remove the rind from the cheese, chop into small pieces and add to a bowl with the soured cream, and use a hand blender to blitz until smooth. Pour into a small container and allow to stand in the fridge. 3. When ready to cook, place the juice, salt and oil in a bowl, add the wings and toss until well coated. Allow to stand in the fridge for 45 minutes. Once the time has elapsed, place the wings on the preheated barbecue and cook for 20 to 25 minutes, turning them every few minutes until cooked through with no pink meat. Once cooked, transfer the wings to the bowl with the barbecue sauce and toss to thickly coat. 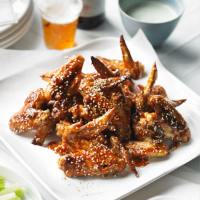 Remove and transfer the wings to a clean bowl then sprinkle over the toasted sesame seeds. 4. Serve in a bowl with the cheese sauce, celery and any remaining barbecue sauce on the side.